Hybrid concrete construction is the combination of precast and in-situ concrete. The different materials are used according to their strengths and weaknesses to provide simple, buildable and competitive high-quality structures that offer consistent performance. Hybrid concrete construction can incorporate all the benefits of precasting, (e.g. form, finish, colour, speed, accuracy, prestressing, high-quality, assured covers and dense and properly cured covercrete) with all the benefits of in-situ construction (e.g. economy, flexibility, moulability, continuity and robustness). Precast and in-situ concrete can be used together in many different ways to extend the design horizons for architects, engineers and contractors. The precast and in-situ elements can act independently or in combination. In addition a structural element can comprise both precast and in-situ concrete working compositely. Examples are given on the next page. Numerous hybrid precast and in-situ systems are available and some are used widely. Precast cladding adorns mainly in-situ framed buildings. Simple repetitive portions of a structure may naturally lend themselves to precast construction whereas more complicated, less accessible sections may lend themselves to in-situ construction. 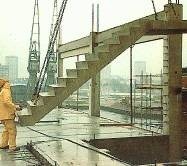 Precast units can directly replace in-situ elements, for example stair flights or hollowcore floor units within in-situ frames. 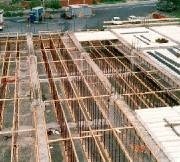 Units can be used as permanent formwork, substituting for and largely obviating the need for conventional formwork. This brings the advantages of factory-engineered concrete to site. In-situ concrete toppings are often added to precast floors for additional strength, stiffness and robustness. In-situ floor slabs can be cast on top of precast downstand beams to give highly efficient composite T beams. Previous Important Chart on Concrete factors like WORKABILITY, SLUMP & COMPACTING.